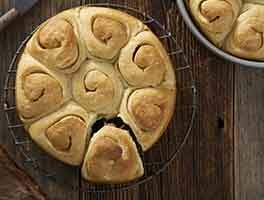 You'd never know these tasty dinner rolls are made mainly with whole wheat flour. Soft and moist, honey gives them just a touch of natural sweetness. 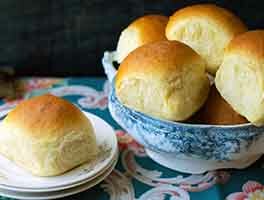 Our Guarantee: These rolls will rise about 2 1/2" high, and will have a soft (not crunchy) crust and moist, tender interior. Their flavor is pleasantly mild whole wheat. If you're using active dry yeast, dissolve it with a pinch of sugar in 2 tablespoons of the lukewarm water. Let the yeast and water sit at room temperature for 15 minutes, until the mixture has bubbled and expanded. If you're using instant yeast, you can skip this step. Combine the dissolved yeast with the remainder of the water and the rest of the ingredients. Mix and knead everything togetherby hand, mixer or bread machine set on the dough cycletill you've made a smooth dough. If you're kneading in a stand mixer, it should take about 5 to 7 minutes at second speed. In a bread machine (or by hand), it should form a smooth ball. Mix and knead everything together — by hand, mixer or bread machine set on the dough cycle — until you've made a smooth dough. If the dough seems very sticky and you're using a stand mixer, it helps to beat it with the beater blade at medium-high speed for several minutes (if the warranty on your mixer allows this), until it starts to come together in a mass. After that, switch to the dough hook at medium-low speed for 5 to 7 minutes. Place the dough in a lightly greased bowl. Cover the bowl, and allow the dough to rise, at room temperature, till it's quite puffy but not necessarily doubled in bulk, about 90 minutes to 2 hours. Rising may take longer, especially if you've kneaded by hand. Give it enough time to become quite puffy. While the dough is rising, lightly grease a 9" x 13" pan, or two 9" round cake pans. Gently deflate the dough, and transfer it to a lightly greased work surface. Divide it into 16 pieces, or 24 pieces, depending on whether you want larger or smaller rolls. Shape each piece into a rough ball by pulling the dough into a very small knot at the bottom (think of a balloon with its opening knotted), then rolling it under the palm of your hand into a smooth ball. Place the rolls in the 9" x 13" pan, or divide them between the round cake pans, spacing them evenly; they won't touch one another. If you've made 24 rolls and are using a 9" x 13" pan, position them in four long rows of six. Cover the pans with lightly greased plastic wrap, and allow the rolls to rise for 1 1/2 to 2 hours. They'll become very puffy, and will reach out and touch one another. While the rolls are rising, preheat the oven to 350°F. Bake the rolls for 15 minutes then, if they appear to be browning too quickly, tent them loosely with aluminum foil. Continue to bake until they're mahogany-brown on top, but lighter colored on the sides, an additional 10 to 13 minutes. Remove the rolls from the oven, and after 2 or 3 minutes, carefully transfer them to a rack. Brush them with melted butter, if desired, for a soft, buttery crust. Serve warm, or at room temperature. No dry milk in your pantry? Substitute 1 cup lukewarm milk for the 1 cup water and 1/4 cup dry milk. Don't bother heating the orange juice to lukewarm; you can use it straight out of the fridge. The orange juice won't add its own flavor to the rolls, but will mellow any potential bitterness in the whole wheat. For a shiny crust, whisk together 1 large egg white + 1 tablespoon cold water. 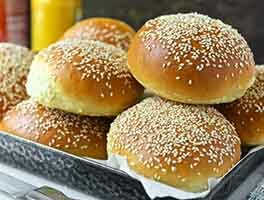 Brush on rolls just before baking; sprinkle rolls with quick-cooking oats as a garnish, if desired. I did not have orange juice so I substituted canned pineapple juice. Could not detect the flavor in the rolls. Fluffy, light and very good. Perhaps I will up.the honey in the next batch, good but I'd like a touch sweeter to take the edge off the whole wheat taste. I really like this recipe. It uses enough whole wheat flour to keep the taste of whole wheat and just a bit of regular flour to keep the crumb nice. The rolls always turn out soft and fluffy. Sometimes I use an extra tablespoon of flour because the dough can be too wet to shape. These rolls are the best I've ever made! 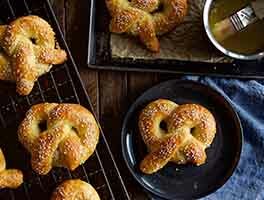 I used my own home-milled flour, and so the fresh flour adds it's own sweetness to them. Yes, the dough is sticky, but with sufficient kneading, it comes together nicely. 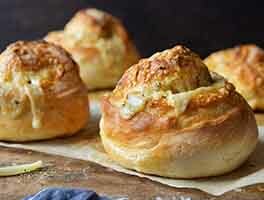 These rolls are always the hit of the dinner party! FAIL! I tossed the whole batch in the trash after they went uneaten on Thanksgiving. First clue something was wrong: a very strange batter. I eventually got it to the point I could shape rolls but after baking, they were soggy and tasteless. I should have taken the other negative reviews to heart and saved my time and energy on this one. BTW I'm a skilled baker so it's not for lack of experience and familiarity with bread and dough that this didn't work out. I won't make this again and do not recommend. Very easy and complete success! I followed recipe exactly, using skim milk instead of powder (needed to use some up). I love how soft (and easy to work with ) potato flakes make breads. I actually weighed each roll to make sure they were (approx) same size, baked in 9x13 pan. This is now my go-to dinner roll. Love KAF!! The first rise took just 45 min but the second time it didn't rise much. The rolls came out flat, but oh boy the taste and softness was awesome. As a beginner Baker I was proud to make them. Delicious rolls. However, I encountered a problem. My dough was very wet and kind of hard to work with. Should I have added more flour when kneading? The wet dough rolls spread out a bit and were touching before the second rise started. At the end of the second rise (~2 hours), the dough was very puffy. However, when I baked the rolls they turned out flat and congealed together-- like one big 9 x 13 in cake. The flavor is nice and they are very moist and fluffy. Can you help me understand how to make them look more like the picture? Many thanks from a beginner baker! Nice wheat rolls. I didnt have any orange juice available so I doubled the honey. Great flavor, nice crumb. Baked up nicely in springform cake pans. A good roll to make when you want something a little different. They're almost all gone already. That's the trouble with KAF recipes and baked goods, they just seem to diisappear! I actually forgot to add the honey to the recipe and was happily surprised with the result! I shared them with my family and friends and they said that if I didn't tell them that something was missing, they wouldn't have noticed. 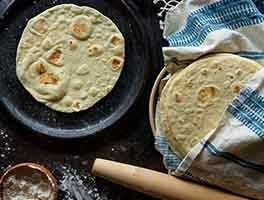 I can't wait to retry these with the honey! I was looking for a whole wheat recipe that I could make a day ahead and decided to try this one. I made them up to the point of forming the rolls in the pan and then covered and put in the fridge. I then took them out 3 hours before lunch. I think they could have used a little more time to rise but were quite tasty. I was wondering if anyone knew some tricks for ways to improve a recipe if you're going to refrigerate them. Also, I only had powdered buttermilk (not regular milk) so I used that. Any idea if this changes the recipe much?